A fast-growth company in a bleeding-edge industry needed a new space to support its own innovation efforts and evolving needs. An extensive site search led to a location that would accommodate engineering, manufacturing, sales + marketing and general operations, previously housed in three separate locations. Starting with a culture assessment, we worked with the CEO to identify both the positive behaviors the company wished to trigger with greater frequency, as well as the negative behaviors and habits they wanted to discourage. Environmental triggers were incorporated into all aspects of the design, from layout to signage to furniture selection and beyond. We found that separate break areas were contributing to the team’s sense of fragmentation and separation. So we created a single, centrally-located kitchen area. The spacious kitchen included welcoming lighting and comfortable seating, encouraging employees to linger for meaningful periods of engagement, facilitating informal employee interactions and connections across teams. Employees juggle a range of tasks that require different levels of concentration and collaboration. Instead of simply choosing between an open or traditional floor plan, we designated and outfitted spaces to support a range of functions. Private meeting rooms for breakaway work also contained collaboration tables, equipped with televisions and easy-access data ports that make in-person or virtual meetings equally possible. Designated quiet rooms and partitioned desks allow for work that requires independence and concentration. Lounge areas and oversized mobile white boards invite collaborative and informal work. Phone booths host private calls. Small huddle rooms are perfect for coaching conversations. 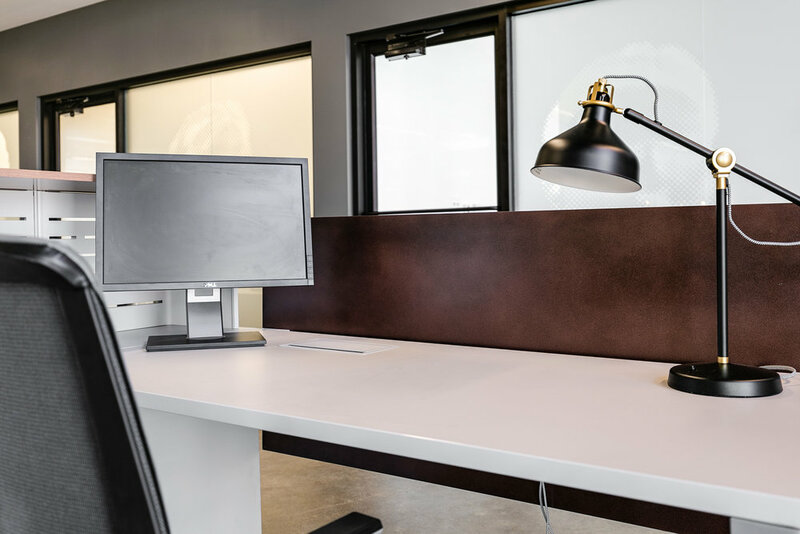 In addition, certain spaces hosted a mix of stand-up desks, stools, counters, tables and lounge chairs to allow for a variety of postures throughout the day, encouraging employee movement, variation, and well-being. By foregoing assigned desks, employees have to think about tasks that need to be accomplished each day and physically move to the space that best supports them. The environment itself requires proactive engagement with the work that is most meaningful, and help avoid the temptation to work reactively from an inbox. Add a stamp of shared identity. We tempered the transparency of the meeting rooms with some partial obfuscation. Employees feel a strong pull to the 20th century inventors whose inventions paved the way for today’s innovations. The names and faces of these inventors now grace the meeting room glass fronts, the output of a poll asking employees to share and vote on their favorite inventors. Story can quickly convey the cultural DNA of an organization to new employees and clients and create a sense of connectedness among all employees. The boardroom table tells part of Organization’s story, with a laser-cut image of the circuit board from it’s very first product. A company’s physical space is an incarnation of the unspoken histories, values, perspectives, and aspirations of the people who choose every day to show up, to give their best, and to chart the future of the organization. For a young, gutsy company like this, the space is also a promise to employees and customers: we live every day with purpose, tackle every detail with focus, and build things that are beautiful, smart, simple, and delightful.